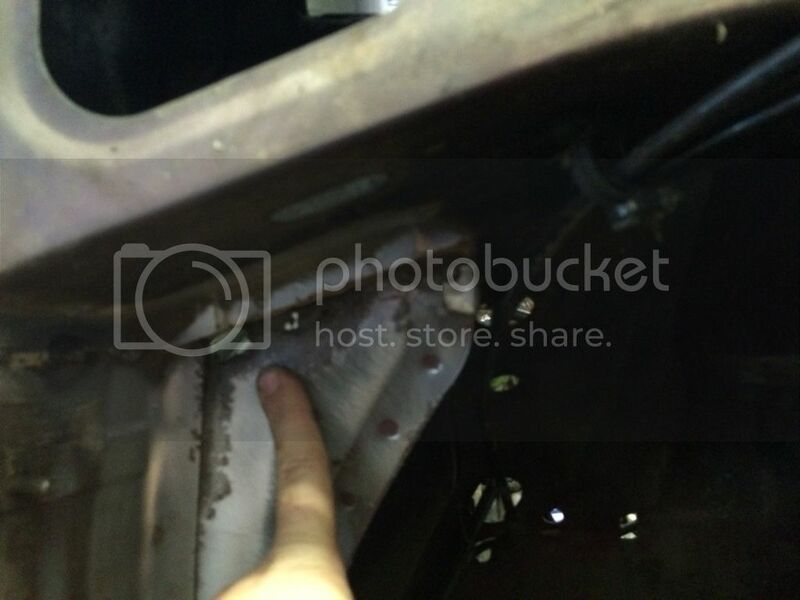 So a little background on my 1991 Mercury Cougar to understand why I'm doing all this. My mom bought the car new in 1991, it is a 1991 Mercury Cougar LS, which came with a 5.0V8, and was originally red with gray cloth interior. In 1994 it took a good hit to the LF corner, and was brought to a supposedly very good body shop to get repaired. My mom used it as her daily driver from 1991 until 1998, when at 206K miles it threw a serpentine belt and left her on the side of the road. I was 16 at the time, and already loved this car from all the childhood memories, including annual week-long road trips that I used to take with my mom in the summer every year. I begged her not to get rid of it, so she had it towed home, gave me the keys and the title, and said if I got it running I could have it. A little wrenching later and about $125 is parts and I had myself a V8 powered coupe for my first car! I drove the car for that first year, just building up even more great memories with it. When I was 18, I lost my license for a while, so I gave (loaned) the car to my cousin, who had just gotten hers. She drove it for about 6 months, then got into a minor accident in a parking lot with it where the front bumper cover got ripped off, a dent in the fender, and a couple broken lights. 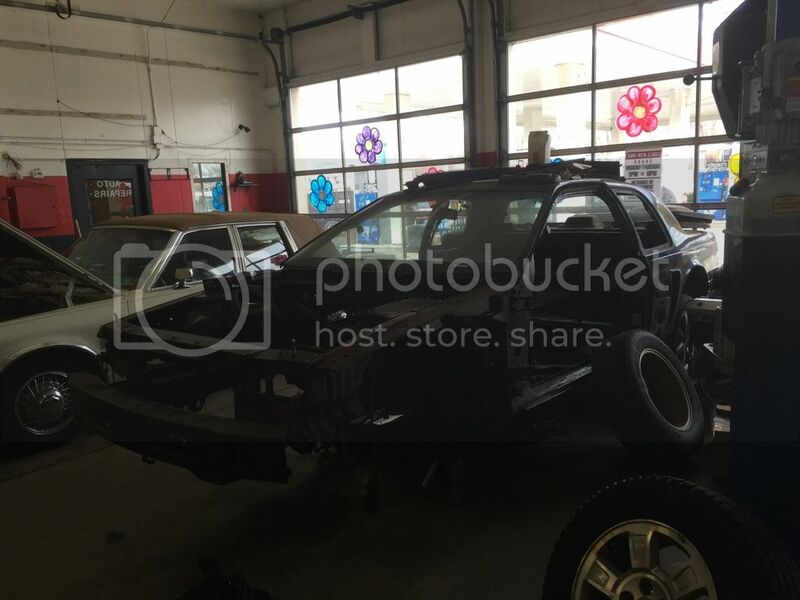 At the time I was going to college, and working part time at a Maaco body shop, so I took the car back from her, counted my lucky stars that it was nothing major, fixed the damage, grafted in side scoops from a 99 Mustang, and painted the whole car black with silver racing stripes and "ELIMINATOR" painted on the quarter panels. Probably not the direction I would have taken with it now, but it has become part of the car's identity, so while it will be redone better, it will keep the same scheme. So the car got repainted, but it still had the original engine, which at this point had over 230K miles on it. 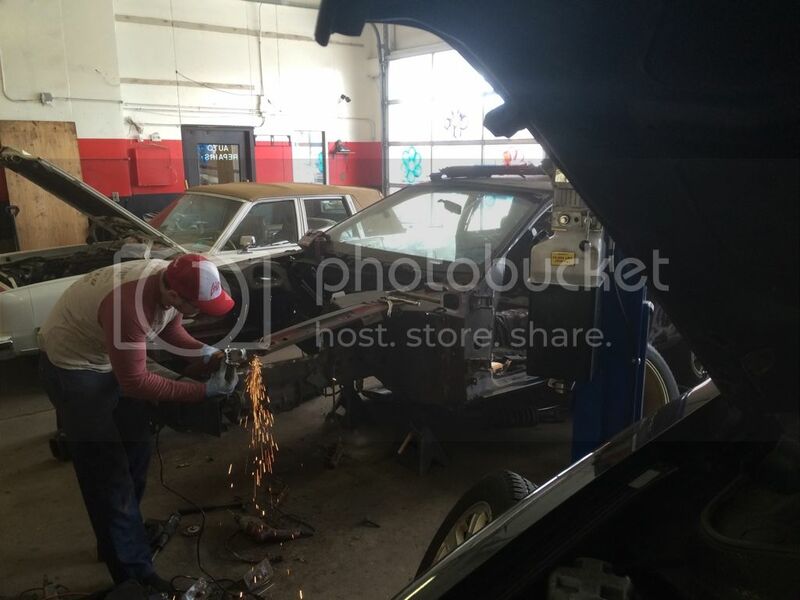 When I was 19 I got a job at a mechanic shop that did Mustang performance work, so in the process of learning there, I decided it would be a good time to do some engine work. I bought a low-mileage short-block out of a 95 Mustang, swapped on some GT40 iron heads, an E-303 cam, and a 3000rpm stall converter. I also swapped in a set of black leather SC seats. At the time, I really didn't know what I was doing, and was working with what parts I could get for cheap, so it was not a well thought out package, and the car still wasn't that fast, but it looked good, and now it sounded pretty mean too with the cam! Anyway, I drove the car like that for about 2 years, until one day on the way from North Carolina back up to NJ, the motor lost oil pressure and started knocking. I had a buddy with a truck rent a U-Haul tow dolly and we towed the car back to my mom's house in NJ, where it sat in the garage untouched for several years. Eventually I had enough money to put together a decent engine for the car, so I brought it to the shop I was working at and went at it. I got a 351W block, sent it out to get bored .030" over, and built myself a budget 393 stroker with some ported Holley systemax heads and a Typhoon intake. At the same time, the auto came out and the car got converted to an M5R2, the cracked gray dash was swapped out to a nice black one, the front suspension got rebuilt, and the car got a set of SC springs and sway bars, and some 17x9 Cobra Rs. 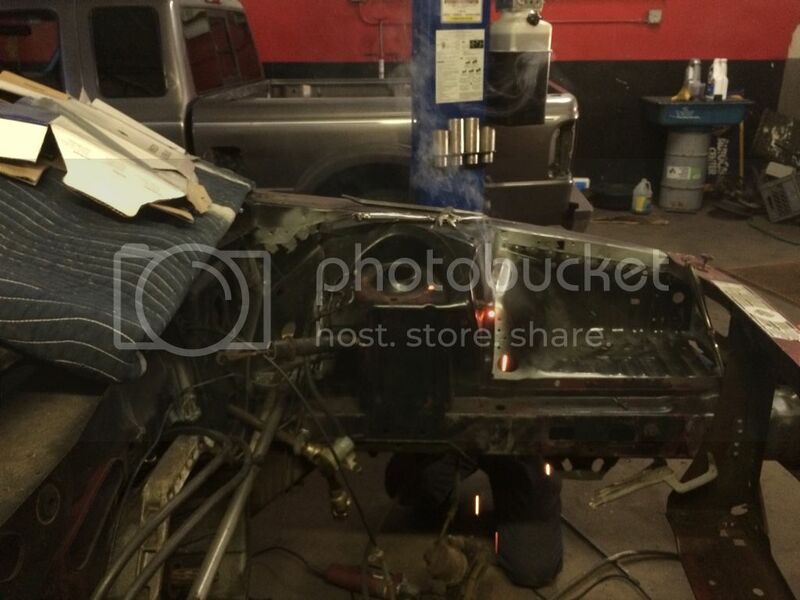 Get everything together, and the engine smokes and burns a ton of oil. Compression check showed 190psi on all cylinders, so it couldn't be the rings, tried new valve seals, different rocker arms, adjustable guide plates thinking maybe the rockers were side-loading the valves, catch can for the PCV system, new intake gaskets thinking that maybe it was sucking oil up from the valley, nothing made any difference. The car got parked on the side of the shop until I could mess with it again, and there it sat, under a tree, covered in leaves and pine needles, growing mildew in the interior, and generally being a prime example of the effects of entropy for 6 years! 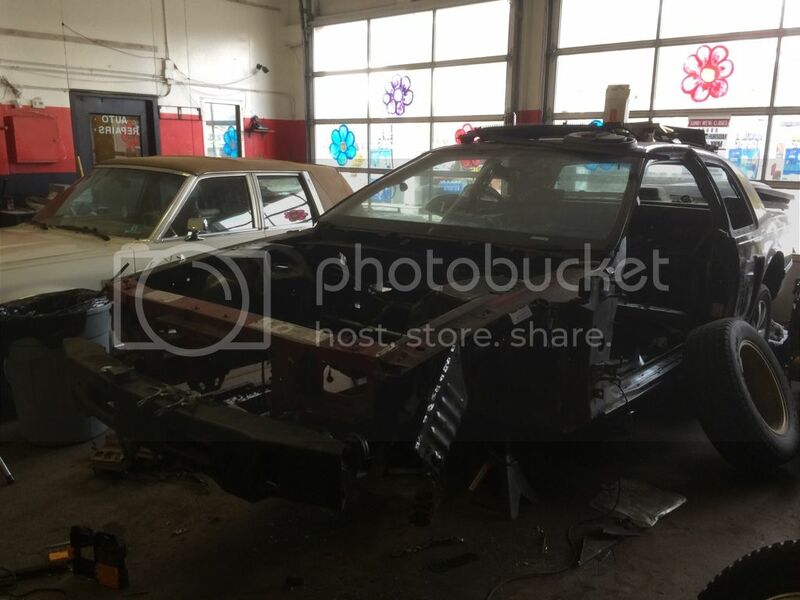 About a year ago, that shop closed up and I had to move my car. I brought it to my house, pulled the 393 out, washed the car, and started assessing the damage. First thing I did was pull the 393 apart to find out what went wrong. It turns out when I sent it out to get bored .030" over, they only bored it .020" over, and I never bothered to measure the cylinder bore, so it scored the hell out of the brand new pistons and the cylinder walls. When I was putting the motor together, I did have to file all the piston rings to get a good gap, but I didn't think much of it at the time. Anyway, that was my oil control problem, as well as why it had such good compression while still burning a bunch of oil. Somewhere in the interim, I had scored a good deal on a Dart block 427" Windsor shortblock, and separately a set of re-done Pro-comp heads, a comp cam, and a Trick-Flow R intake that had all made 430hp to the wheels on a 408W in a Mustang, so that is all put together and sitting in my garage at home, and will be going into the Cougar. Still not sure what I'll do with the 393, but I did have the bore fixed, and bought all the parts to put it back together. On to assessing the rest of the damage from sitting. 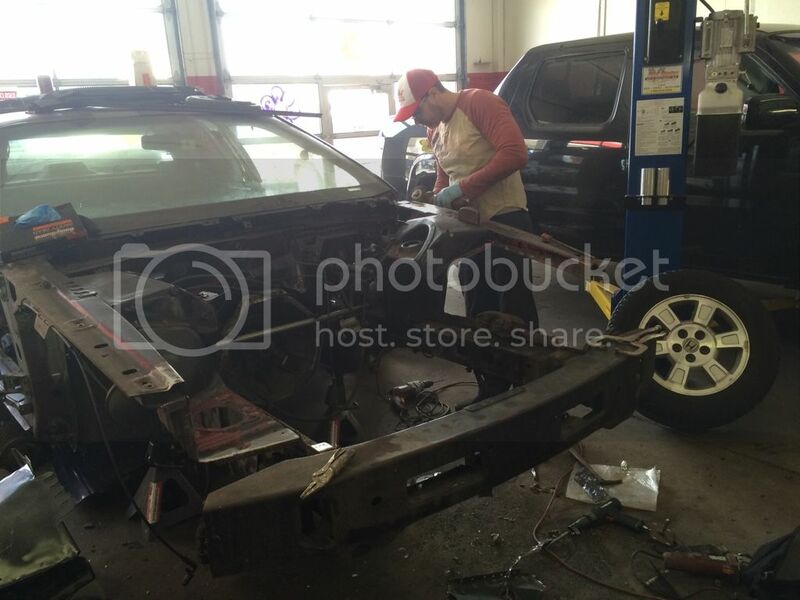 I brought the car to the shop and started pulling everything apart. 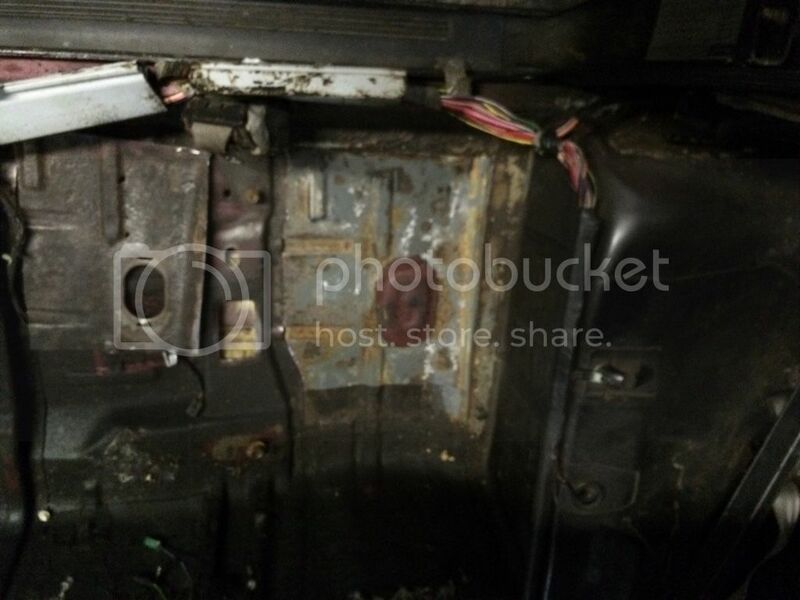 The interior is completely trashed and covered in mildew. The dash is probably salvageable, but the seats, carpet, and headliner are all done. Both doors are completely rotted out along the bottom. 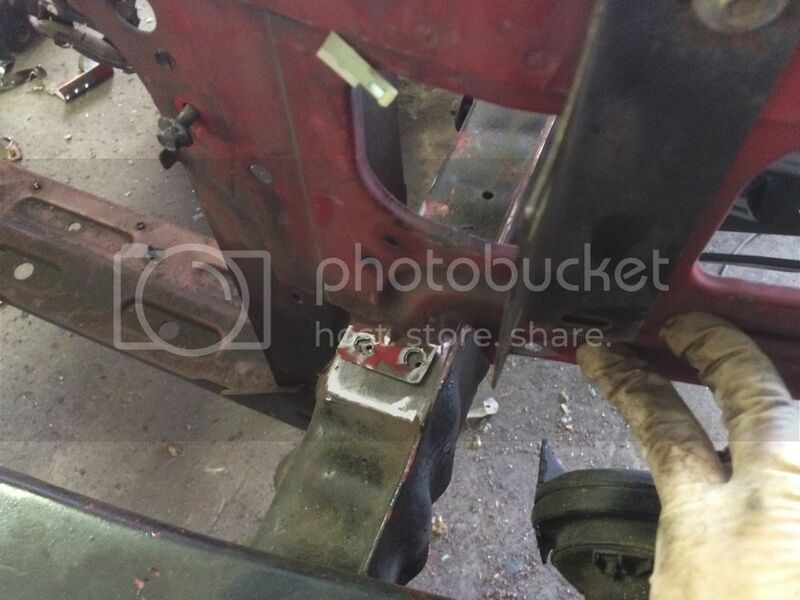 The left rocker was starting to bubble in a few places, so that has been cut out and will be replaced with new metal. 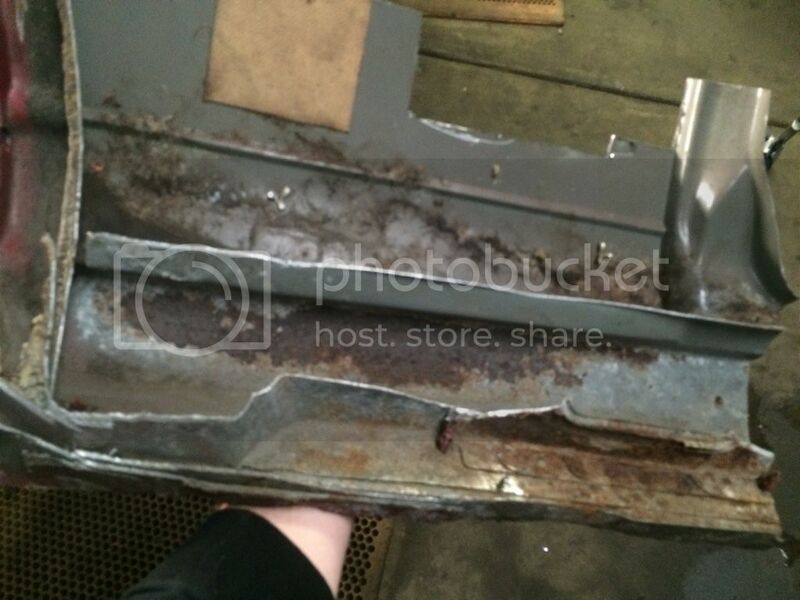 Luckily the inner rocker structure is completely undamaged. 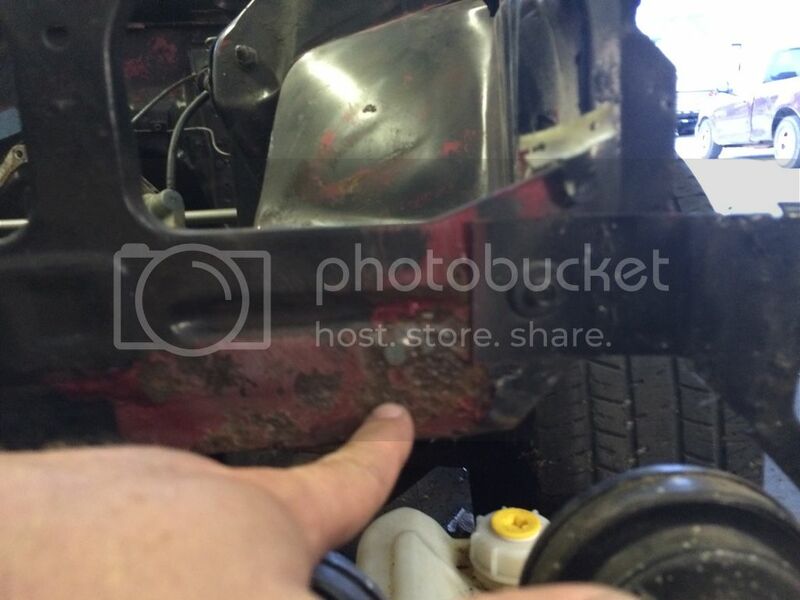 There is a small rust hole behind the right fender where all the dirt and crap accumulates. 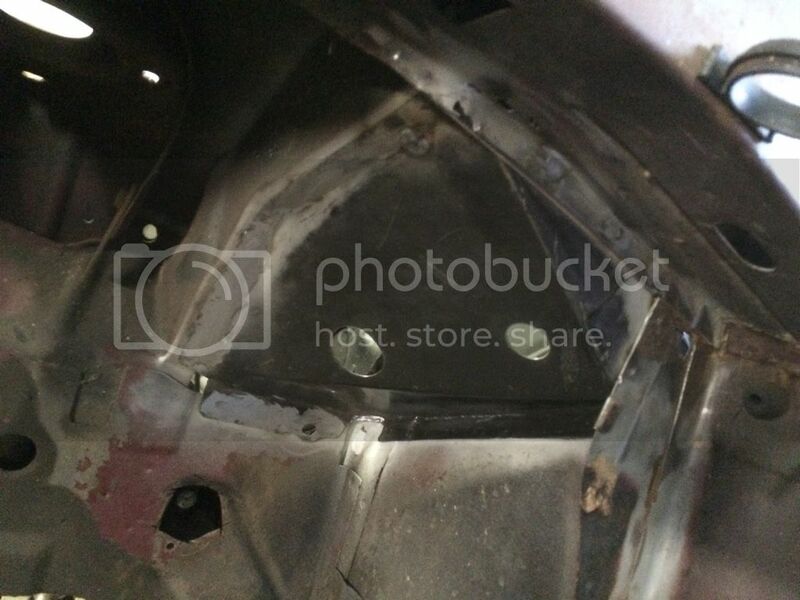 The passenger side rear floorpan has a bunch of small holes and will have to be sectioned. 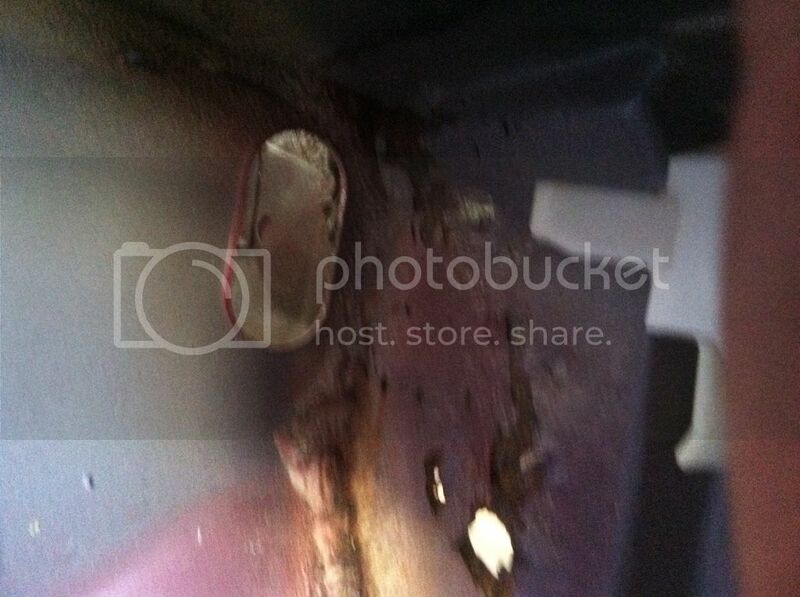 There is a rust hole at the right hinge pillar up near where the ECM mounts, there is a small hole in the same location on the left side, and probably the most serious problem is the left aprin and upper rail, as well as the left side of the rad support are rotted out. 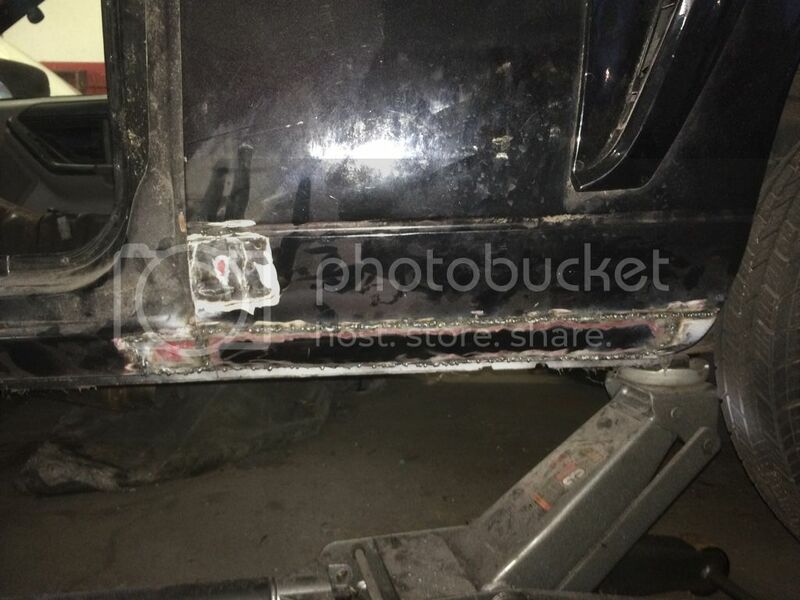 It turns out that high end body shop never restored corrosion protection between the panels, drilled holes in the rad support to pull it, and just covered everything in body filler hoping nobody would notice! 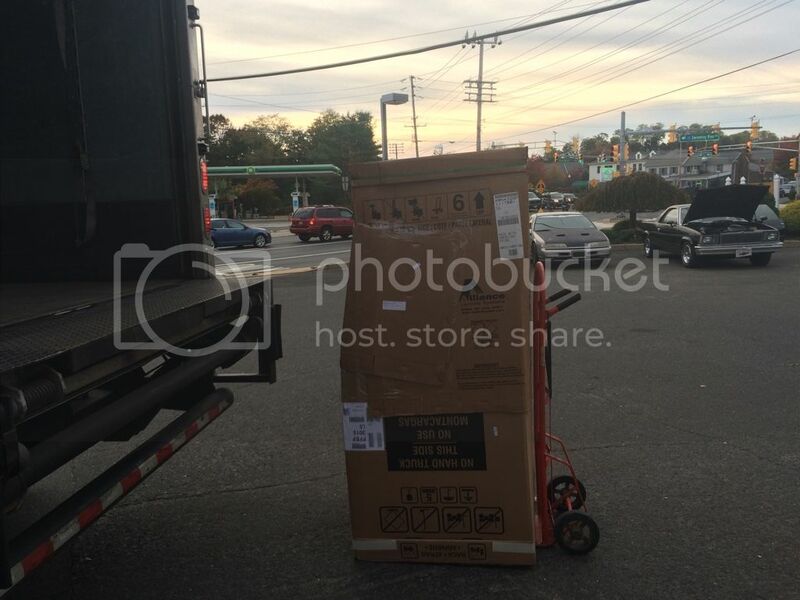 A few phone calls today, and I found literally the last new aprin assembly in the country, so $550 including shipping, and it is on its way to me. I'll be on the lookout for a rust-free parts car to get the doors, driver's rocker, rad support, and the panel behind the right fender. 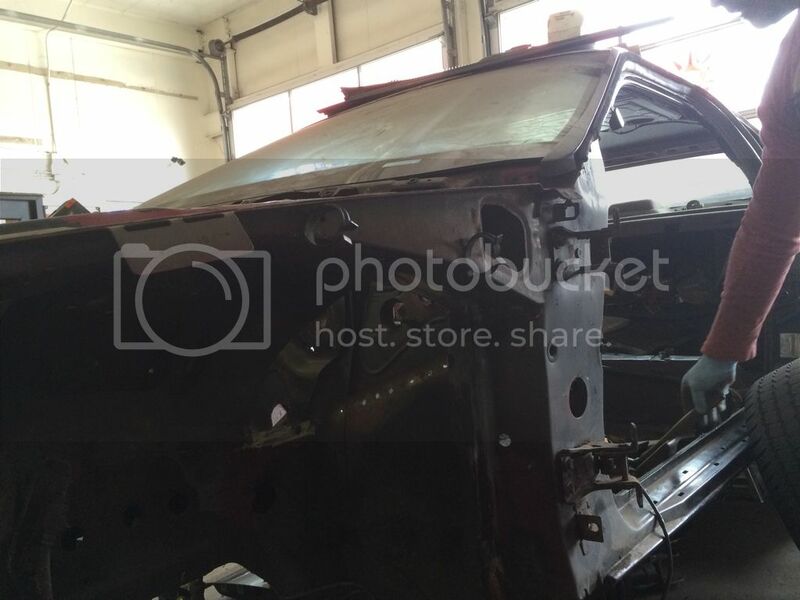 This type of structural body work is also well above my comfort level, so I'll be calling in some favors and writing some big checks to get that fixed, but once it is all done, the car should be solid again, and then the car will get POR-15 on every inner panel so I never have to deal with this again, then paint, re-assembly, and hopefully have a crazy small block for powered Cougar. Anyway, here are some current pics. I'll have to dig up some old ones for everyone too. 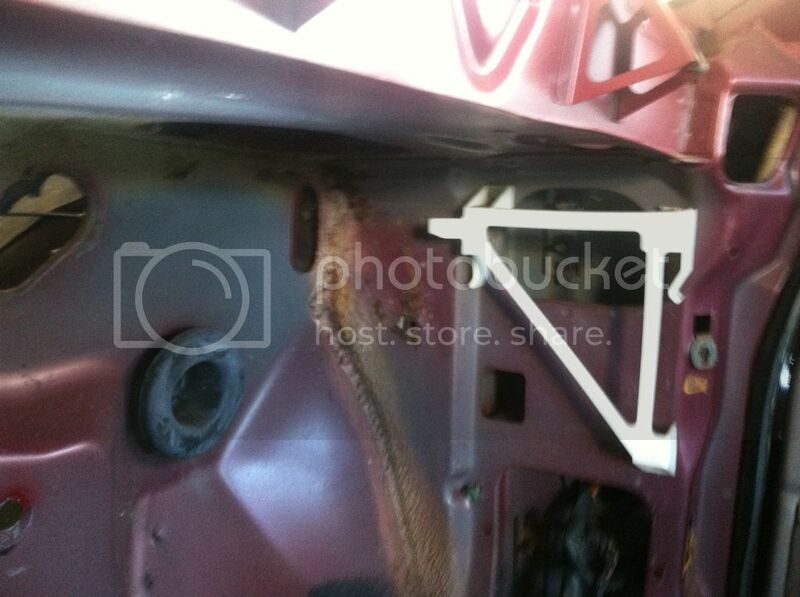 Holes drilled in rad support to pull it, and rad support rusted out. 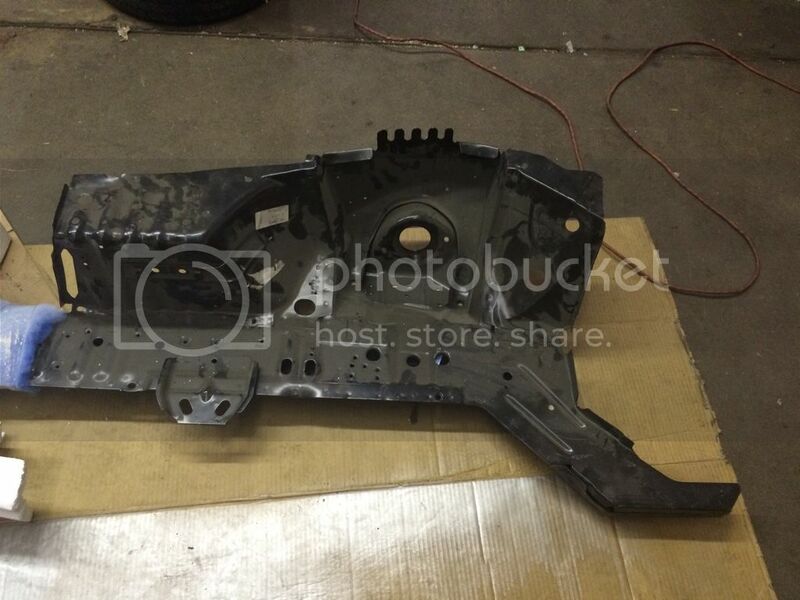 This is behind where the left headlight would mount. 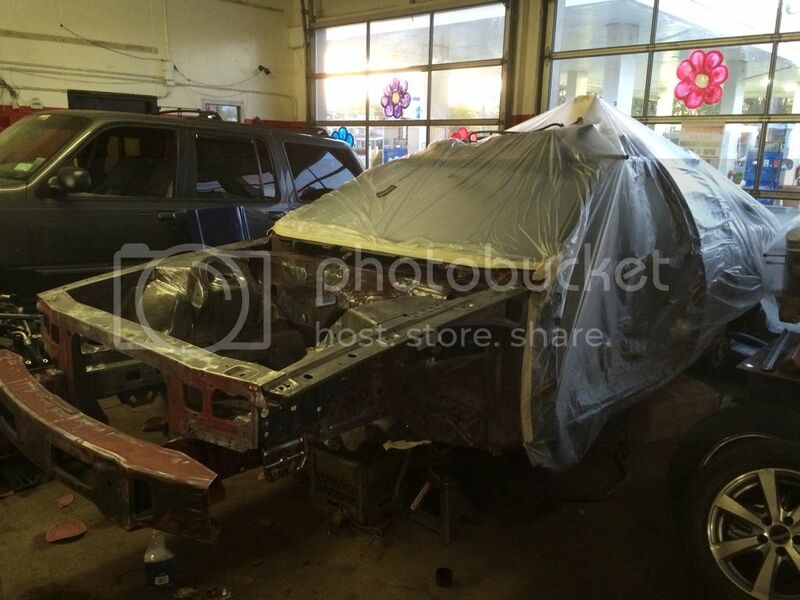 Compromised crush zone in LF that the body shop just covered up with filler. 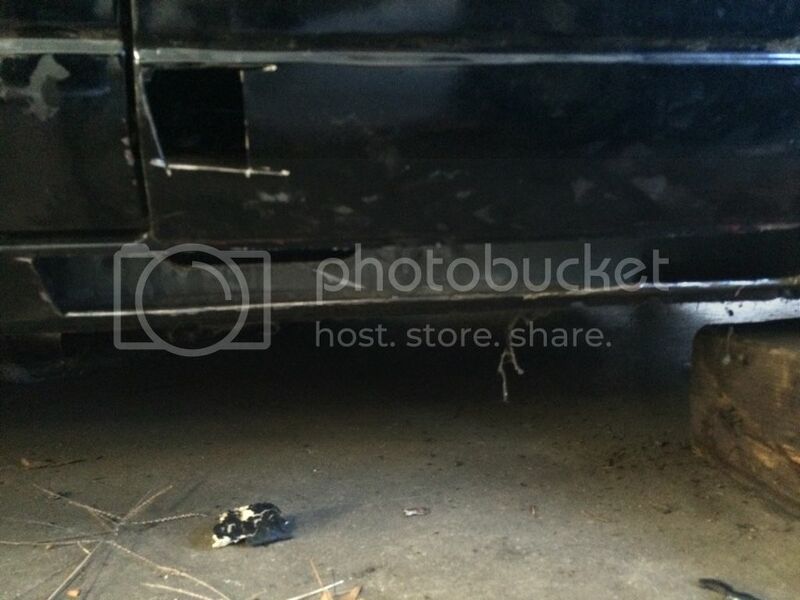 Hole at the bottom behind where the right fender would mount. As of now, I probably have about 8 hours of time into just taking everything apart and assessing the rust, not counting removing the engine, which is probably another 6 hours, plus the $550 spent for the new aprin. I'll keep everyone updated on the rust repair and how much time and money it winds up costing me, this way everyone else will know why they shouldn't do what I'm about to do! You know how everyone is always saying if the rust is that bad you'd be better off finding another shell for your MN12.. I can see why you're not using a different rust-free body to start with..Given your cars history, and how long it's been in the family.. 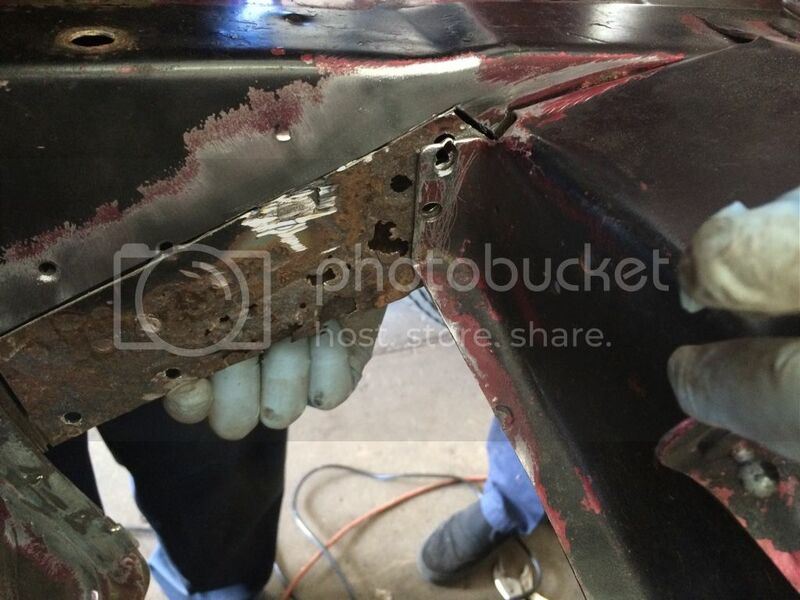 I could see this being a great go-to thread that shows where these cars typically rust, and the pics will help immensely..
Good luck on this long expensive journey..
WHO SAYS YOU CAN'T BEAT CANCER! Great to see it getting fixed! Nothing wrong with a car with a few battle scars. Apron, with an O. Cool story, good to see it saved from the crusher! Only problem is the picture and description made it sound like it came with the upper rail and not the lower (which I don't need), but it turns out it comes with the lower and not the upper. A buddy of mine gave me a line on someone who may be willing and able to do the work, so I'm going to give him a call tomorrow and have him look at it to see what he thinks about whether I should get a new upper rail, or if it would be easier for him to just patch the rusted area. If that part is completely out of production you may want to have it 3d scanned and saved for future preservation of the mn12. I don't know if you meant last of them for now or last of them forever. Just a suggestion if it is the later. This thread is the awesomeness of awesome. Where in Kansas did you get that? Hope you don't mind me asking. Look forward to seeing/reading your progress. It came from Bob Allen Ford, not sure what town they are in. The part was completely covered in dust, and has a production date sticker on it that reads 10/96, so this piece was literally sitting on their shelf for 18 years! And Chris, yes this is the last one forever. If someone wants to come and do a scan before it goes on the car, they are more than welcome to, but I seriously doubt that anyone else will be going this in depth into one of these cars any time soon. Aside from my sentimental attachment, there is absolutely no reason to go through all this when a solid shell can be had for $1000. Yup, there's a rust free Arizona 95 bird in Bucklin, Ks. Guy wants 300 for the whole car. Blown engine, and picked over but the underneath is clean. I can appreciate the sentimental attachment. One of the main reasons I keep my T-bird. What's this rust stuff you folks keep talking about? I wish you had started this project last year when Dan and I were parting out those three tbirds. We would have lopped off whatever sheetmetal you wanted. 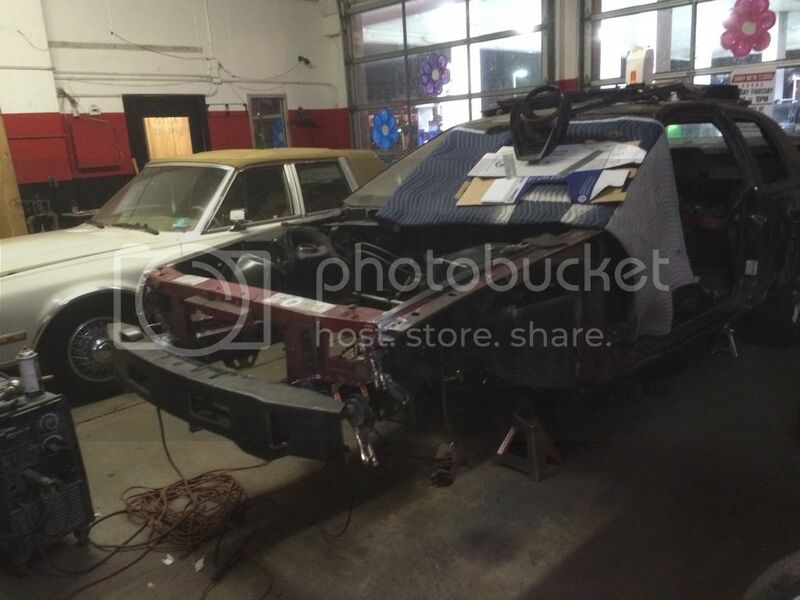 How's the progress on the Cougar going?..Still in the body work stages?? What's this Rust and Emissions stuff y'all keep talkin' about? Not a whole lot of progress. 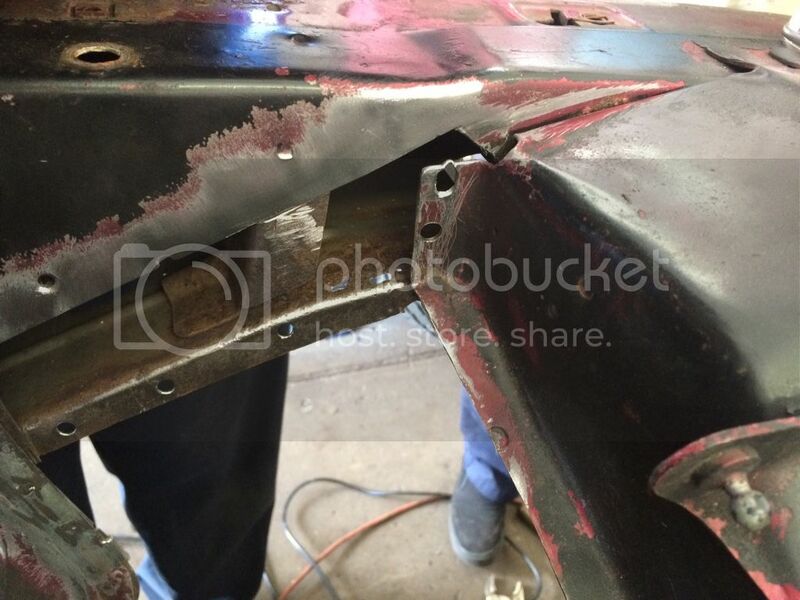 I'm still trying to find someone who is both qualified and willing to do the structural rust repair. I have one friend who I know could do it right, but he has nowhere to do it, and he was supposed to be buying a house with a large garage where he said he could do it, but that deal has been held up due to title issues. 2 other people came and looked at it, one said he didn't want to get involved, and the other said he would get back to me and never did. 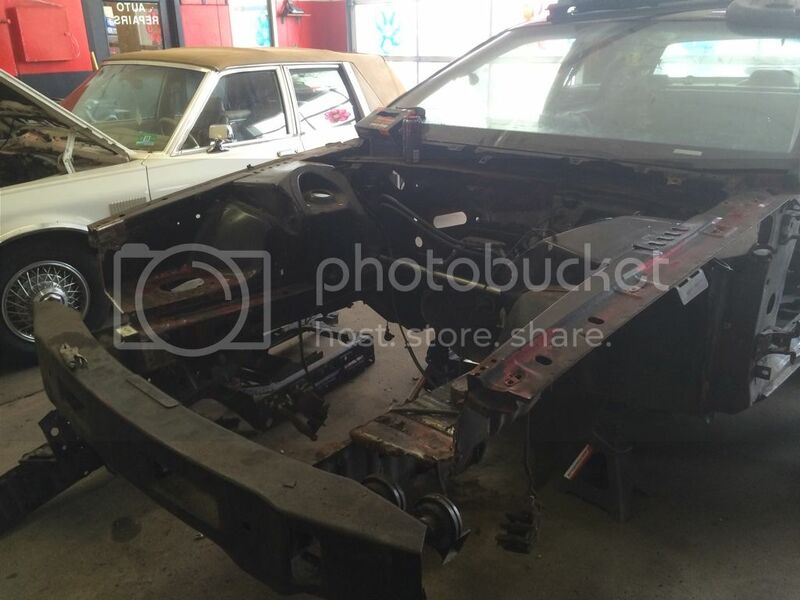 There was one other person who came highly reccomended, and who had sectioned a rusted out rail on a customer's 72 Challenger, and he said he was going to come look at it several times, but never did. Now I have a line on another person who is supposed to come and look at it, but with the holidays, he hasn't had time, so the car is kind of stuck in limbo while I try to find someone able and willing to do it. Not a lot of progress, but a little bit made today. 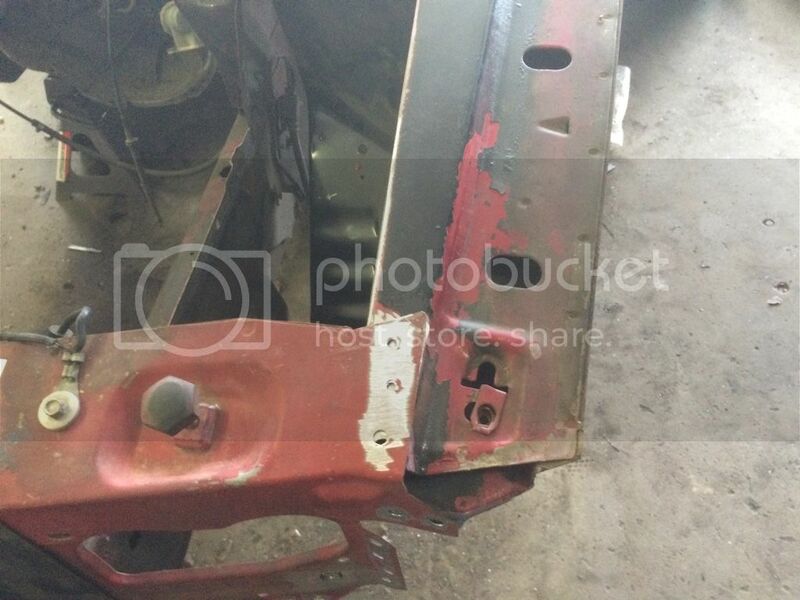 I spent probably 6 hours on it today and I got the driver's side rocker and the one spot on the quarter patched. I still need to do some more grinding and welding on it, but I ran out of grinding discs. 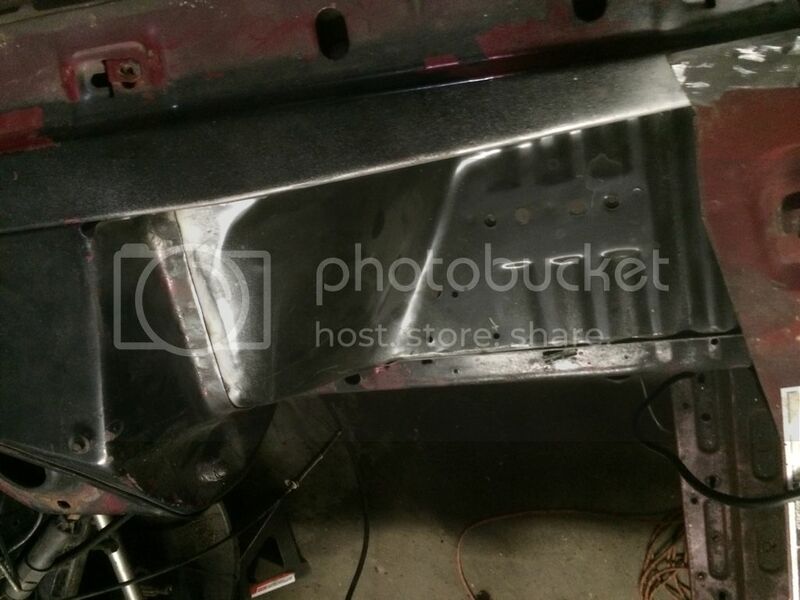 I was originally trying to save the seam line from the rocker to the quarter, but some of the metal was too thin to weld to, so I ended up just cutting it back, spraying some rustoleum on everything inside, and then welding the top seam directly to the quarter panel. I'll fill the seam on the other side too, so once it is done, only someone intimately familiar with MN12s will notice. 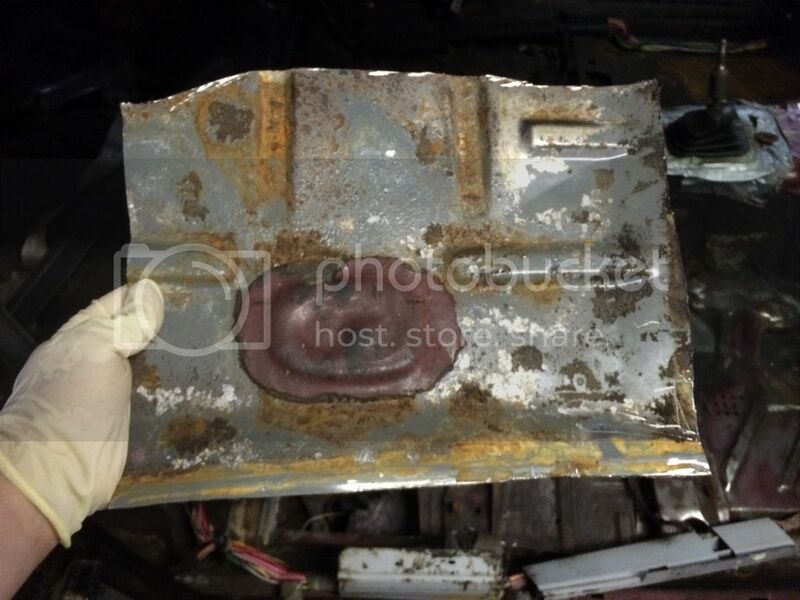 I had cut some patch panels off a car that someone on SCCoA was parting out, however when I looked at the driver's side rocker patch I had cut off, it wasn't in much better shape than what I was replacing. 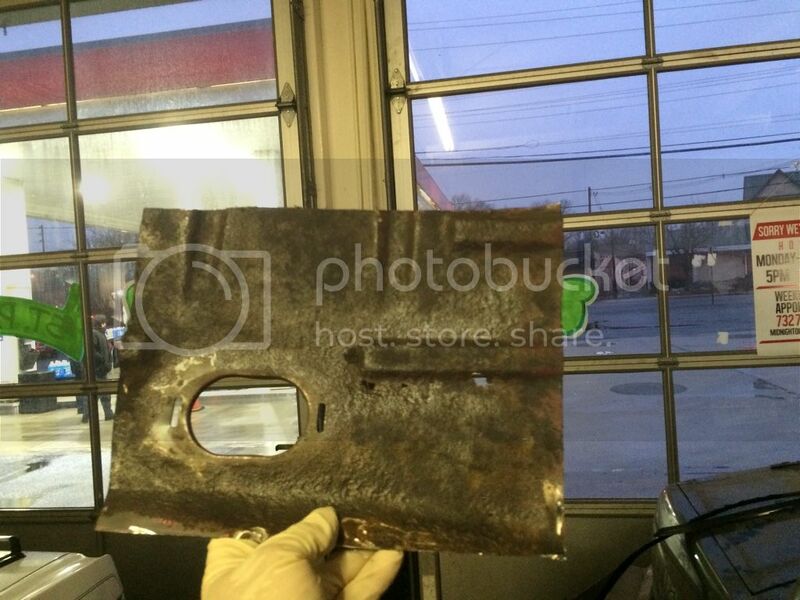 The local metal supply store isn't open on weekends, and home depot didn't have any 18 gauge steel (just 16 or 22), and since the driver's door needs to be replaced anyway due to rust along the bottom, I cut a piece out of it to make my patch panel for the rocker. 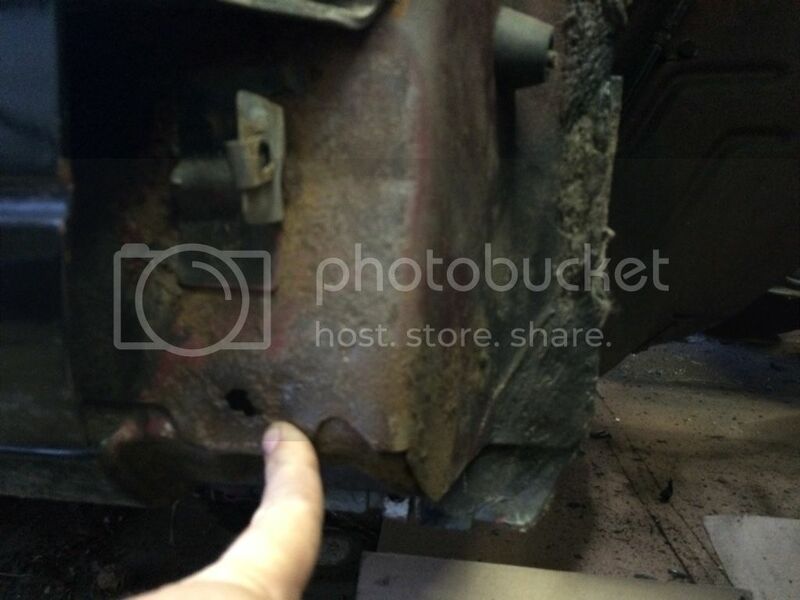 I also cut out the rusted area of the passenger side rear floor and trimmed the patch panel for that to slightly larger than the area cut out. The spot on the rear floor will be held in place with some panel bond (which I need to buy). 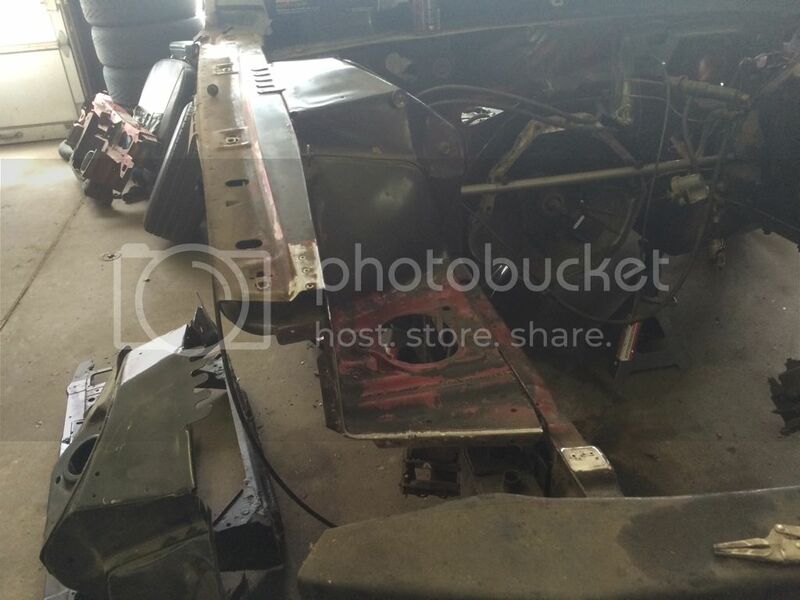 I also might have a line on someone willing and able to deal with the structural work on the front end. A friend of mine gave me a contact who was supposed to come and look at it one day this week, but couldn't make it, so I'll have to call him again and see when he can get out here and take a look. 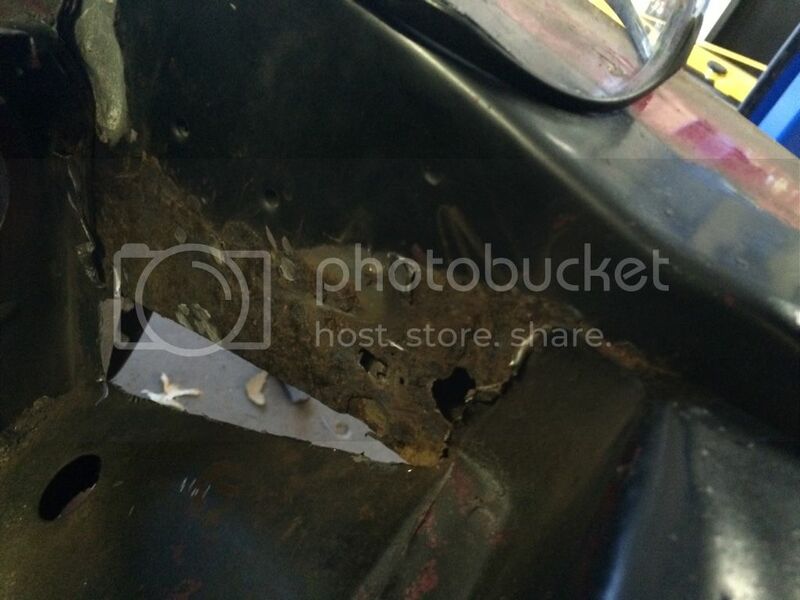 Well if nothing else that chunk of rocker is a good example to all of us of how the rockers rust - Wet sound deadening, poor water drainage(notice how it's built up at the wheelwell corner). It's nice to see you making some progress on this build.. I've always wondered about the Mustang side scoops you have on the quarters..Are these just stuck on, or are they actually serving a function? Have any pics of the back side of them? That must have been weird cutting a hole out of your door.. They aren't functional, but I did have to cut a hole in the quarter to make them sit flush. I installed those on the car back in early 2000, so the edge mustang had just come out, and I liked the way they looked, so I decided to replicate the look on my own car. 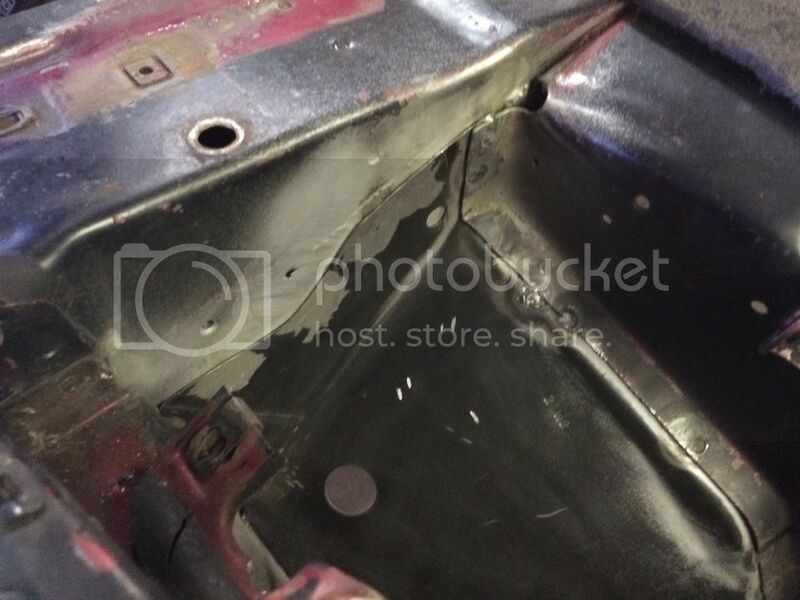 I cut a hole in the quarter just large enough for them to sit flush, then they are riveted in placed around the perimeter, and then I used fiberglass and body filler to smooth the edges and make them one with the quarter panel. 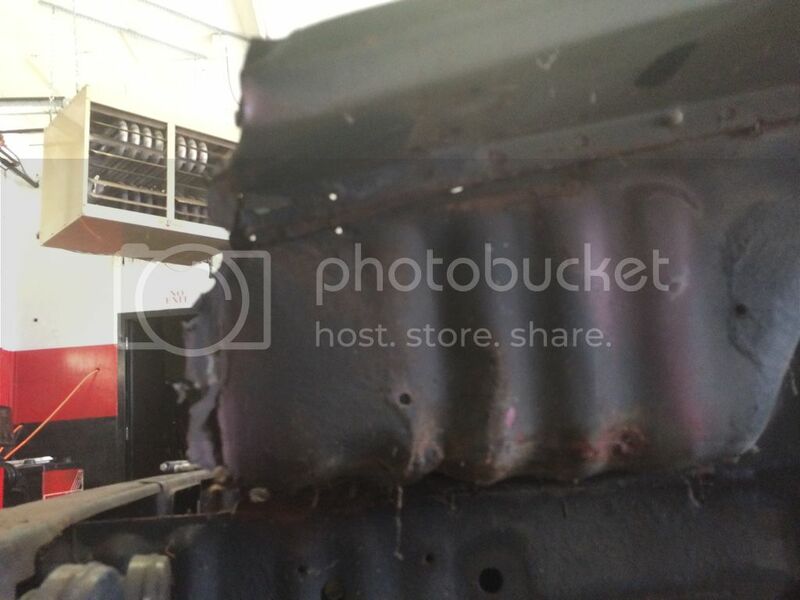 Unfortunately doing that means that eventually it will crack, and if you look close, you can see a couple round marks where the rivets are that the filler on top of them is cracking out. If I had it to do all over again, I would probably not bother, but like the "ELIMINATOR" lettering, it has become kind of part of the identity of the car, so the scoops will be staying. 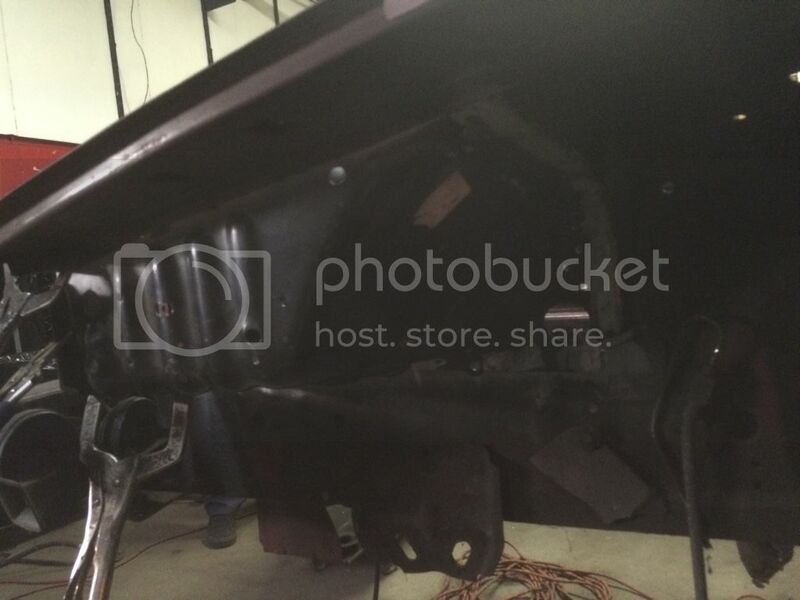 If I could figure out a way to make rear brake ducts out of them, I would, but there is a whole lot of stuff in the way of that, so they are basically just going to stay as cosmetic only. As for cutting the hole in the door, it didn't seem weird, it seemed like the perfectly logical thing to do, and as a matter of fact, now that I have done it, the original doors will probably be the source of more sheet metal for this project. However after trimming out the patch panel to the cardboard template I had made, lining it up and seeing a perfect paint match, THAT was weird! 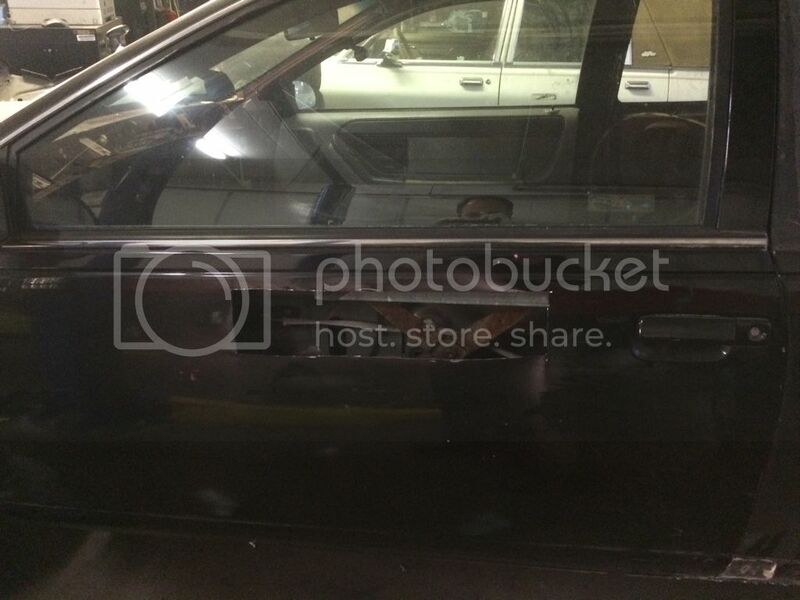 I've looked at older pictures of your car, but it was always Black in those pictures..
Was the car originally Red?? 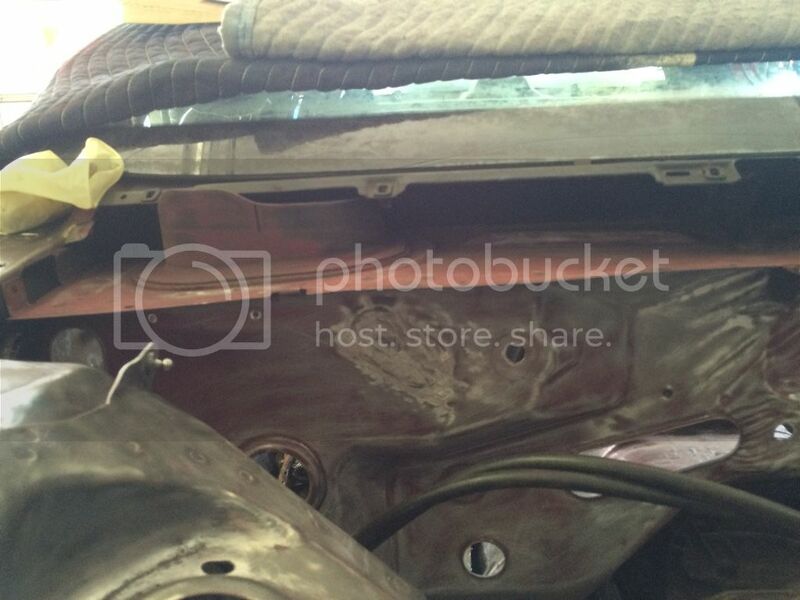 Oh yeah, and did you have to pull out any "sound deadening" material when you welded in the patch panel at the rocker? 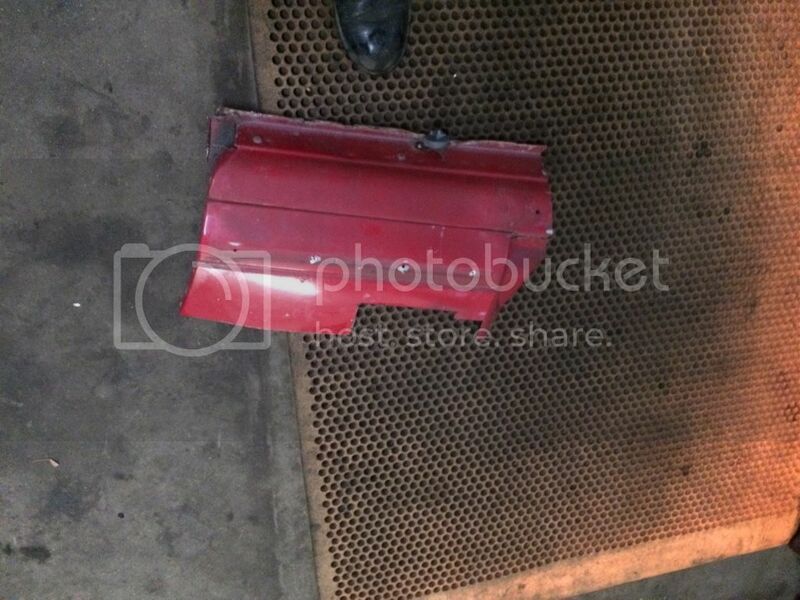 Yes, the car was originally metallic red. I painted it black in 2000, and I painted the door jambs, inside of the trunk, and the engine bay at the same time, since I didn't want it to look like a color change. 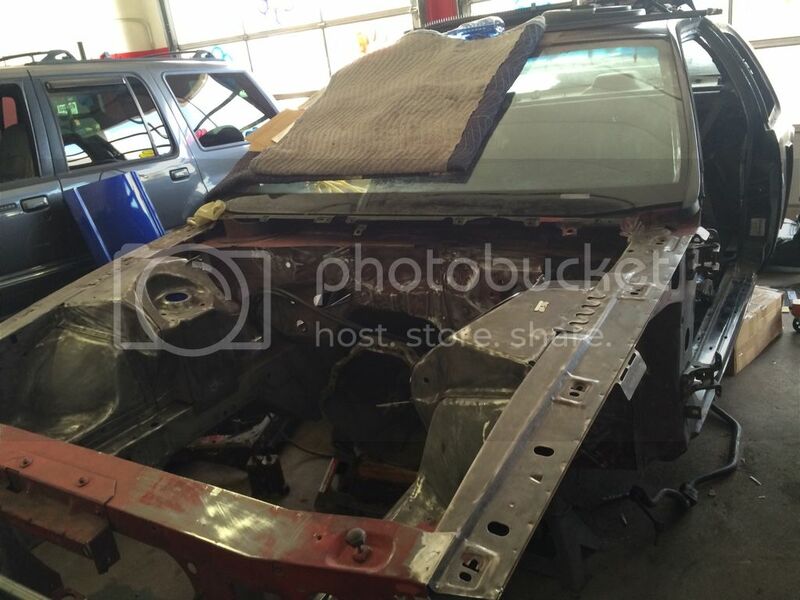 This time, it will be going even farther since the car is basically stripped down to a shell now, and all the insides will be painted before putting anything back together. 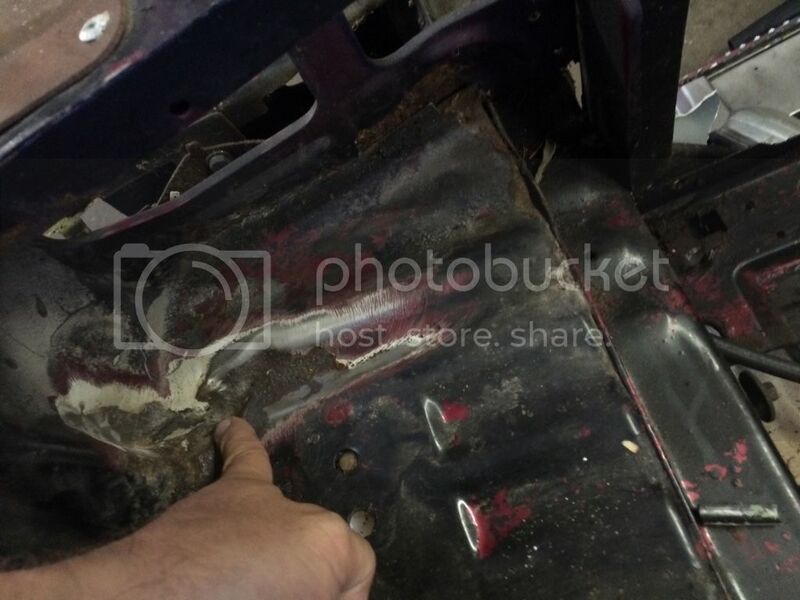 As for the sound deadening, there is no sound deadening in the rocker area, since that is basically sealed off once it is installed. 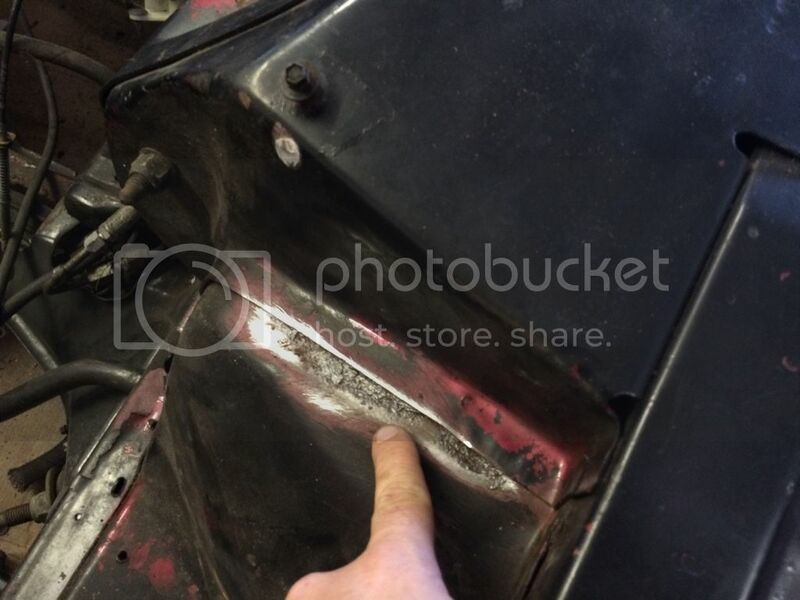 The only access to the backside of the rocker for restoring corrosion protection is through the holes for the sill plate in the driver's door area, so I'll be spraying copious amounts of cavity wax in there to keep this from happening again. 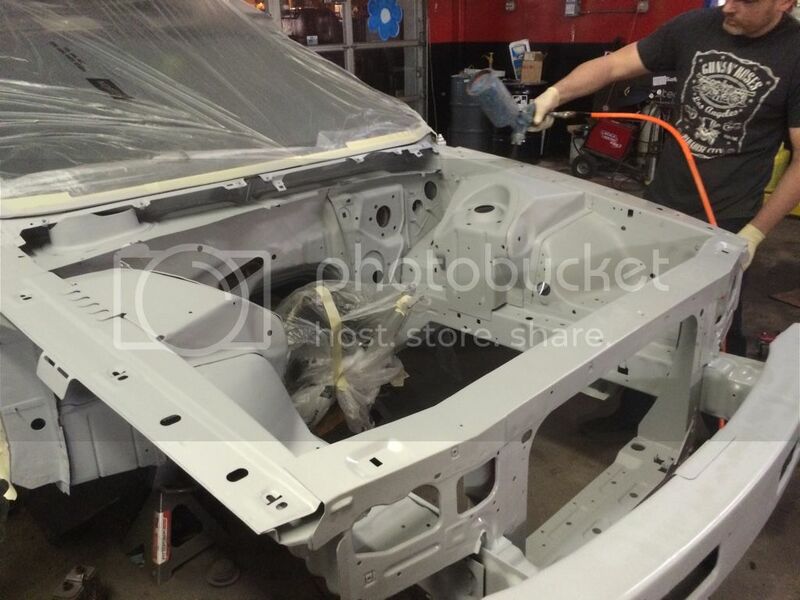 If you are looking to remove your sound deadening, all of it can be accessed through the rear speaker hole inside the car. That was also done to this car back in 2000, and I think that is why the rockers are in as good shape as they are! So I finally found someone qualified and willing to tackle the rust repair on the car. 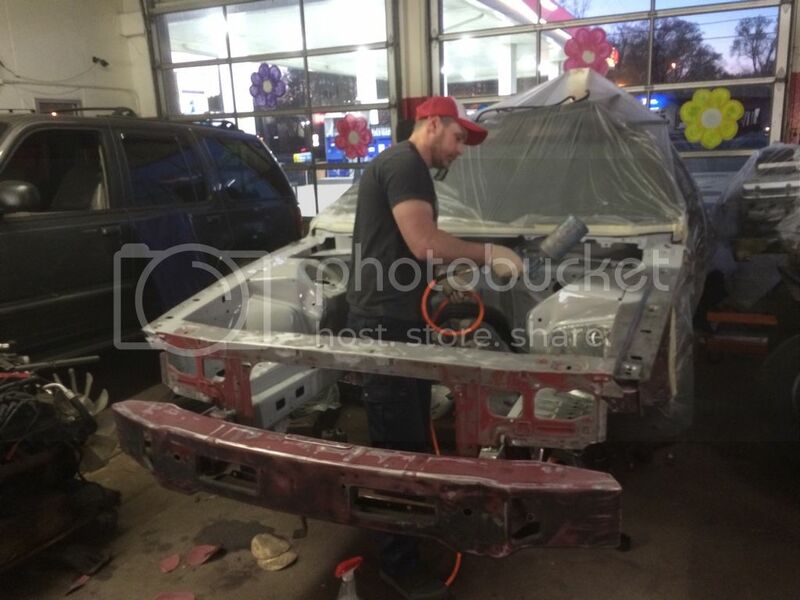 Up until last year, this guy owned an auto body and restoration shop with his brother, but due to issues working with family, they closed up at the end of last year. 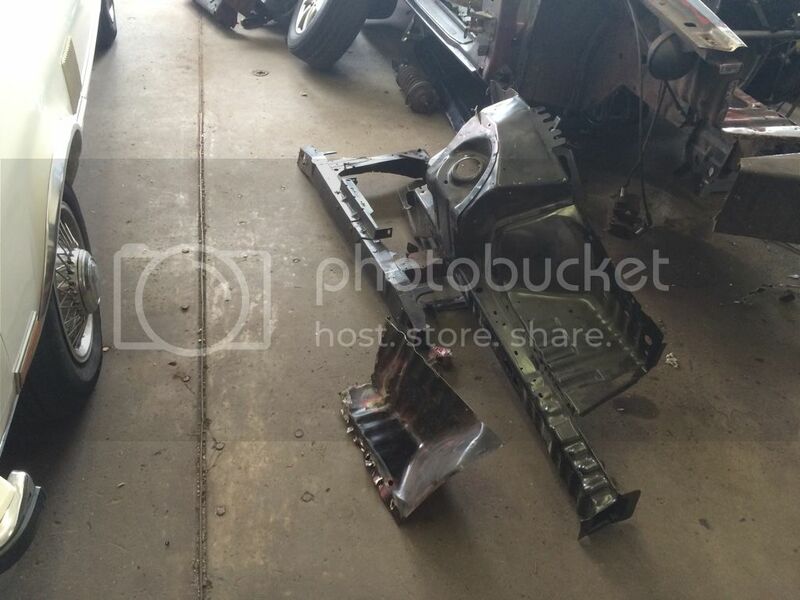 He came a couple weeks ago and took a look at everything, said it would be no problem and he has rebuilt much worse, and showed me pictures of a 74 Mercury Comet he recently repaired that the whole front structure was rusted beyond repair, so he fabricated new rails and pieces of the shock towers. Anyway I didn't want to update this until I knew for sure he would actually show up, since I have had no luck so far getting someone to tackle this, but he showed up today and worked on the car in my shop while I was doing a customer's car. He is billing me $30/hr for however long it takes, which I consider to be an absolute bargain, and I'll probably have him do all the body-work and paint on the car. Watching this guy work was amazing. He jumped right in, and inside of half an hour he had the old rad support off the car. He plugged away all day, cutting, trimming, and fabricating patch panels, and by the end of 8 hours, all the front structure rust was cut out, the appropriate patch panels were cut from the new aprin I bought, the used rad support I got to replace my rusted out one was trimmed and lined up, and the patch panel for the rusted out section on the upper rail was fabricated, and all of those pieces were mocked up and clamped in place with vice grips. He is going to be coming back after work every night this week, and he suspects that all the rust repair will be done this week! Without further ado, here are the pics I snapped during the day as he was working. 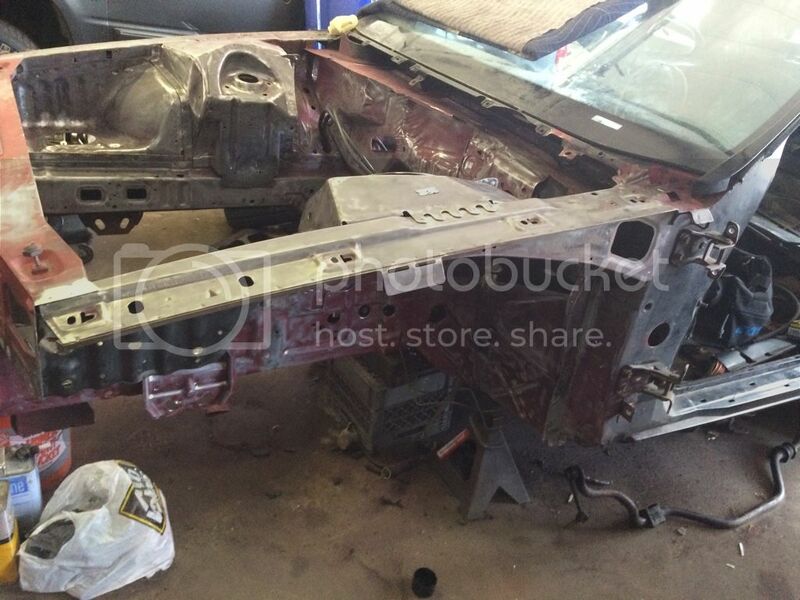 Before he got here, I pulled the doors off, removed all the suspension, and dropped the front subframe out of the way. She's coming to together alright..
After looking through the most recent pics you posted of the progress..I for one am grateful you are keeping a photographic record of the work.. 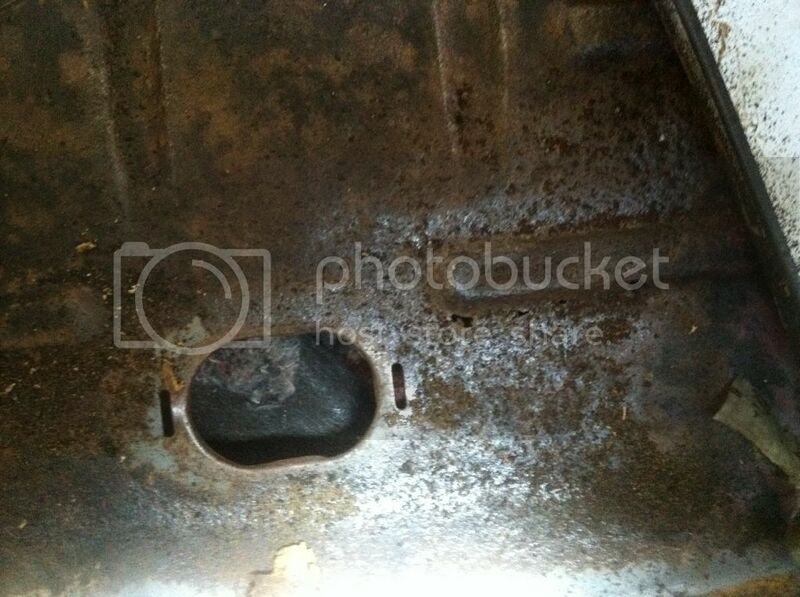 Living in the north means a lot of us see this thing called "rust", and by you documenting every rusty piece that's getting replaced on your car..
That helps those of us interested in seeing the spots where these cars are the most prone to rust..
How do the floor pans, and the rear shock towers look?? 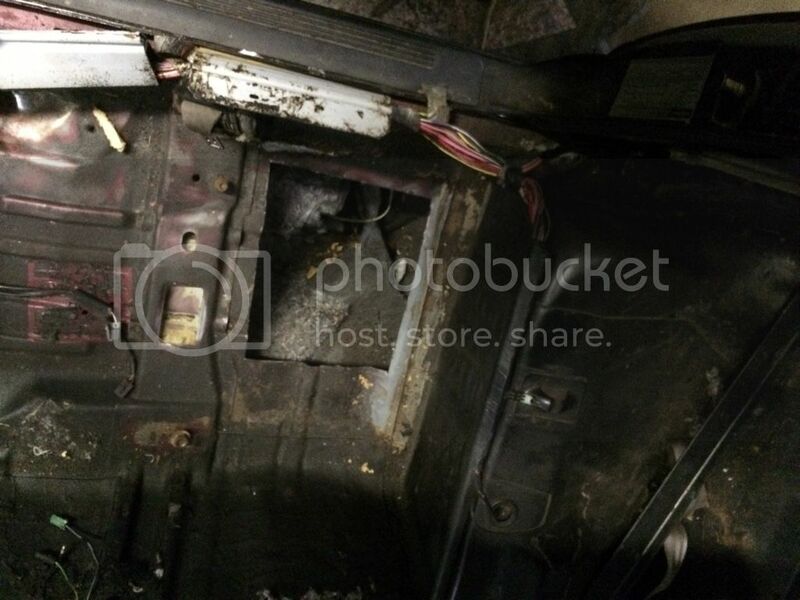 Honestly, I haven't looked at the rear shock towers from inside the car, but there is no evidence of rust from the outside. Now you have me worried about that! 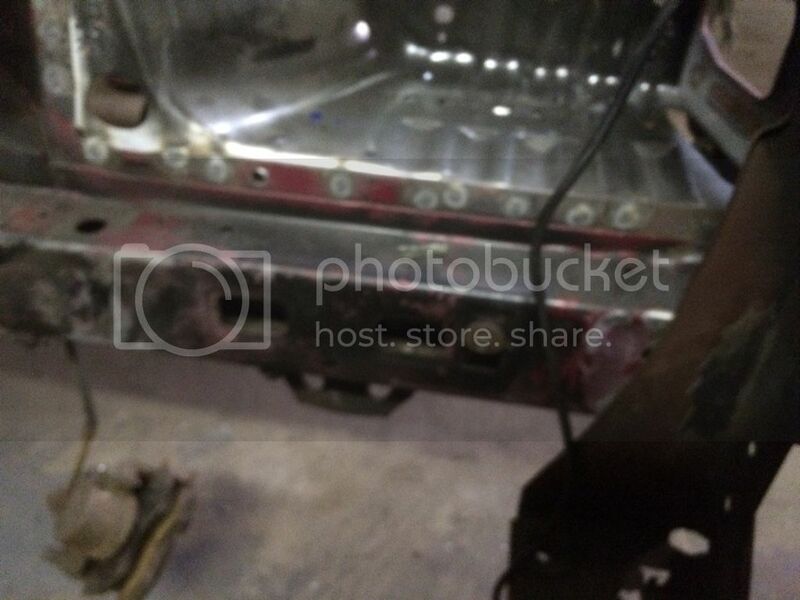 The floor pan needs a couple patches, one at the passenger side rear footwell, which I have a picture of that all cut out and the patch panel fit, but not welded in, and it also need a section of the front floor in the channel that runs along the outside near the rocker. 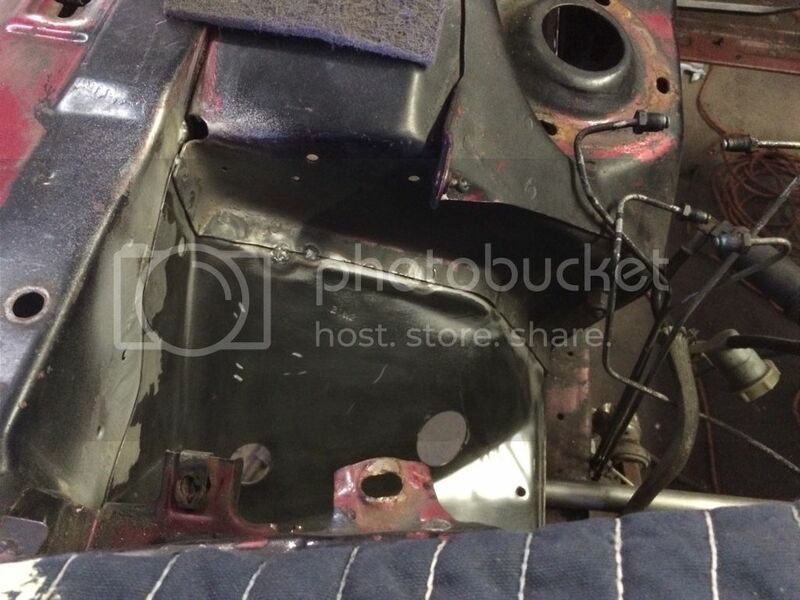 The driver's rear floorpan is fine, and the driver's front floorpan I sectioned a piece in back when I put the 393 in the car. Glad to see this moving along. Keep the pics of the progress coming. Looks like the wait for the right body guy was worth it. It's cool to watch talented people work! I'm sure you're feeling a bit relieved knowing it will be done right. Good luck and congrats on making progress. Definitely! I was thinking when I did finally find someone to do the work, that the car would be held up for weeks if not months. 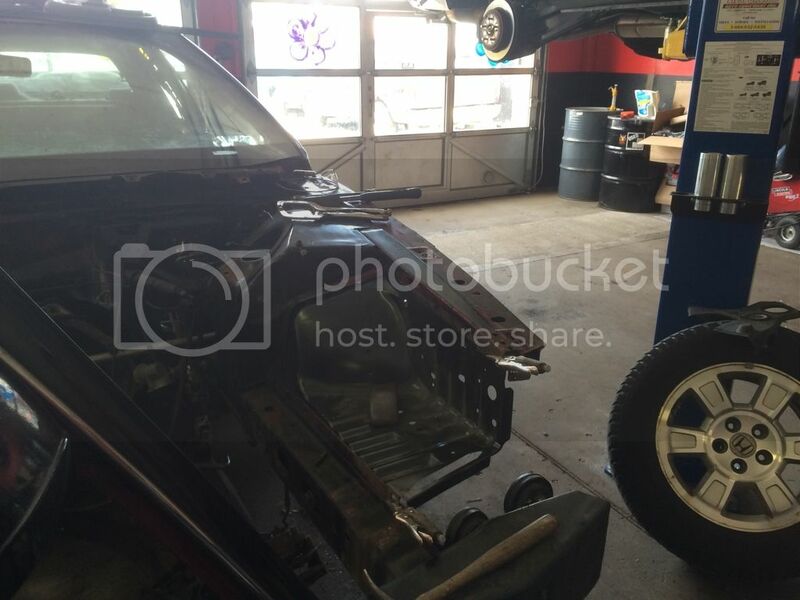 At this rate, there is a chance I could have this car back together this summer! I'm not going to rush it though, especially since the car is a 91, so next year it qualifies for historic plates and insurance! Good to see it progressing though! 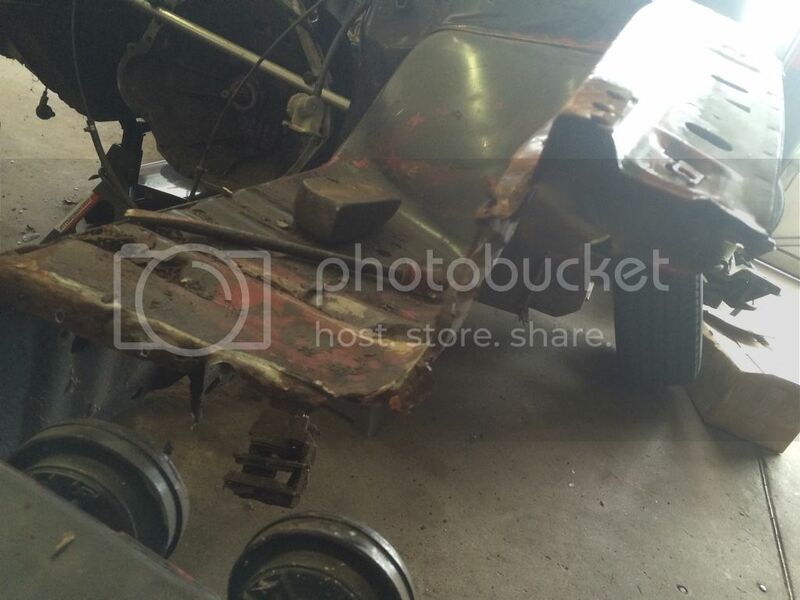 By far the most extensive body work I've ever seen done on one ours cars. Your labor of love actually pulls on my heart strings. Back together by this summer. Sweet. I wish you all the best in your progress. 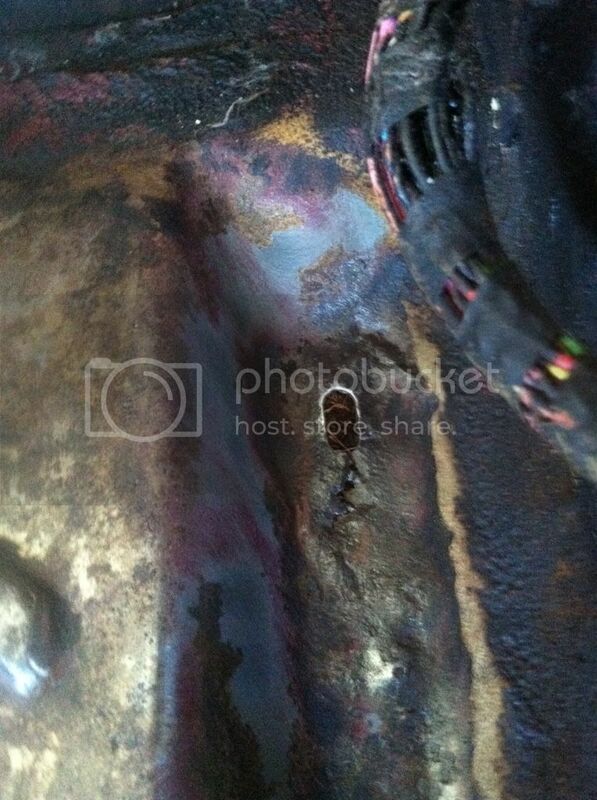 So the body man came back yesterday and plugged away on the car for another 4 hours. 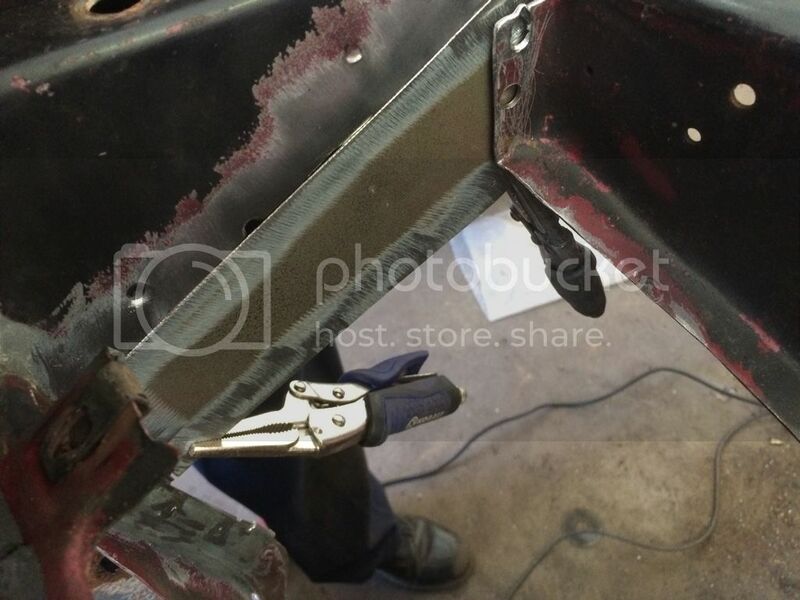 The whole front structure is all welded back together, except for a few spot welds on the front of the rad support that still need to be done. He will be coming back on Thursday to finish that, and continue with the other work. 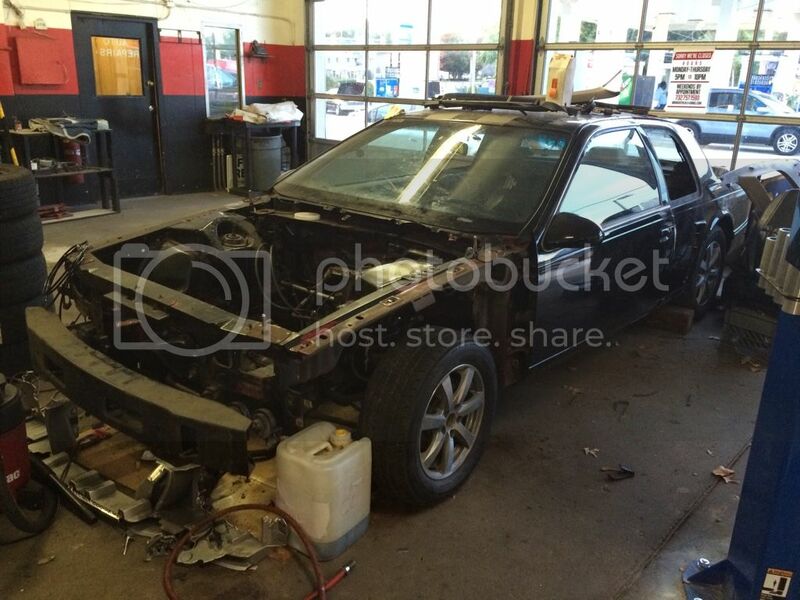 After that, we just need to strip the peeling paint from the engine bay, prep it, and respray it, and then I'll be able to get the motor and front suspension installed. man this is pretty cool mikey, I'm glad your back at it, I remember the last time we spoke on the phone you were having those oil issues with your new 393, hard to believe that was 6 years ago!!!! Some more progress! The guy doing the body work has been coming by as he has time, basically spending 3-4 hours a night a couple nights a week on the car. 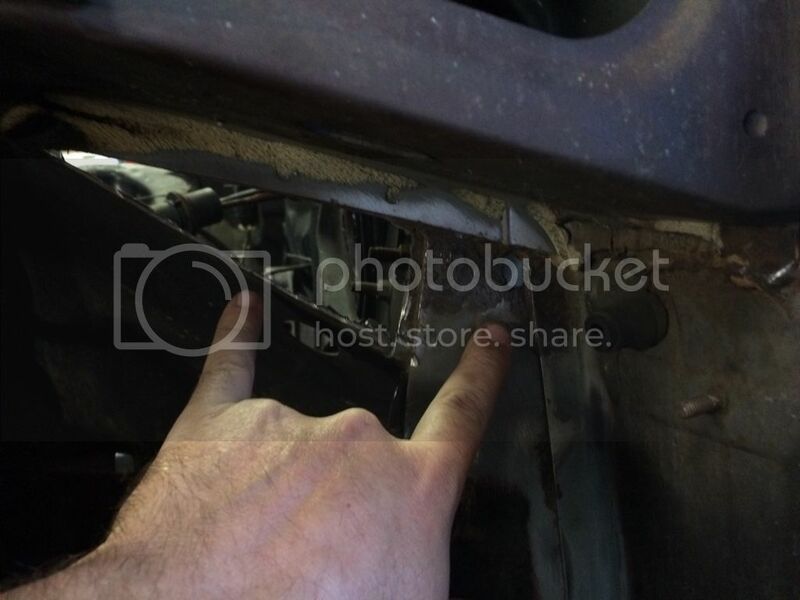 Since this car will not be getting AC re-installed, I had him patch the hole in the firewall where the AC lines came through. Next step is a spreading seam-sealer, then painting the engine bay, then the subframe, motor, and suspension can get re-installed. 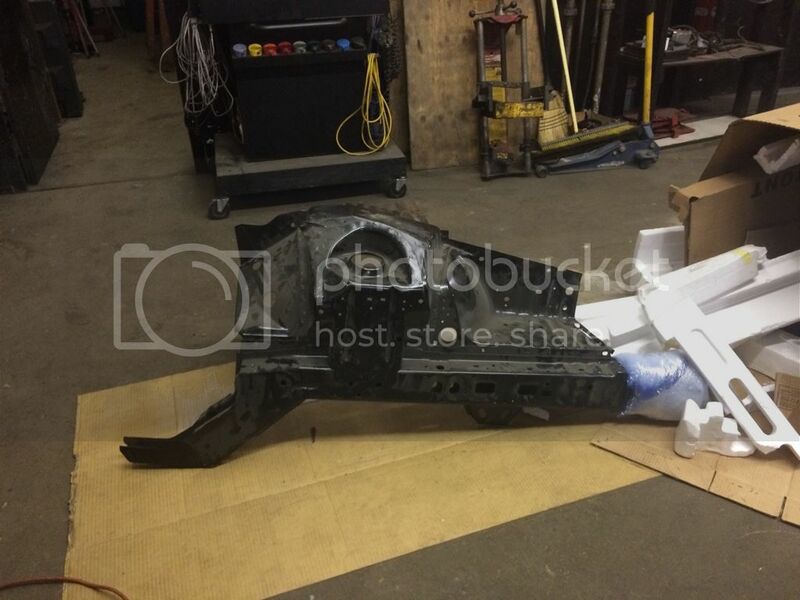 The engine bay is going to be done in a semi-gloss black, and the wheel wells and underbody areas are going to get sprayed with a black bedliner material to prevent any issues down the road. I've also been thinking about paint options for the exterior. I've pretty much decided that the stripes and "eliminator" lettering should be a darker color than they were. My aunt recently bought a 2015 Ford Edge that is a dark gray metallic (ford calls the color Magnetic), and I think I'll use that color as the secondary one, which should be more subtle against the black. I'm also debating the stripes and trying to integrate the eliminator lettering into a stripe down the side, but then the stripes along the top would make it too busy, so now I'm thinking maybe some kind of side stripe, and then just use the same color on the hood where it leads into the scoops on the Mach1 style hood. Any thoughts or ideas on what to do with this would be appreciated. Last edited by MadMikeyL; 04-28-2015 at 11:10 PM.